I'm glad I started P10P, because now I can record which products I'm finishing and try and use up products which I'm not too keen on! These three products have been finished for quite some time, but I just haven't been able to find the time to blog about them. 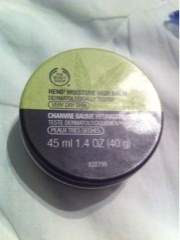 First, we have The Body Shop Hemp moisture high balm. I used this for my eczema when it was particularly dry and flaky. The texture is similar to Vaseline, and it can get quite greasy so I would only recommend this if you have extremely dry skin. I'm not going to be repurchasing as I'm hoping to try out a different product which may work better at reducing/calming the eczema. 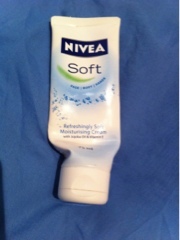 The next product on this post is the Nivea Soft Moisturising Cream (75ml tube). This is a great body moisturiser and I've been using it on both arms and legs. I've always loved the smell of Nivea products, but didn't like the texture of the Nivea Creme (the one in a blue tub). This one has a light texture but still moisturises pretty well, and the tube was the perfect size to fit into my uni bag! 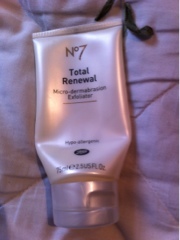 Final product which is finished is the No7 Total Renewal Micro-dermabrasion Exfoliator. This is an exfoliator which I have had for ages (bought from Boots clearance) and it leaves my face smooth and feeling clean. I definitely didn't get as many spots when using this product on a regular basis. However if I wasn't light handed when exfoliating, I would end up with a red face (because it can be quite harsh and irritate the skin). I used minimal amounts of the product once or twice a month to avoid over-exfoliating. Not sure if I'll be repurchasing as I'm on the look out for an exfoliator which is not as harsh on the skin. Definately would not recommend for sensitive skin! This is an alternative method to having a microdermabrasion facial rather than going to a salon.